Just dots in the distance….. The leat that looked to be flowing uphill! For the third year running, the club has run a series of races for novice juniors, with the winner being awarded the Peter Pocock Achievement Trophy. The series has been run on Sunday lunchtimes during the summer, mainly using Picos kindly loaned by the Lakes Trust. The first photograph below shows Mark Pocock (who presented the awards) with some of the competitors, including Emily Veal, Meg Higgs, Fraser Martyn, Annabelle Rademaker, Willemijn Rademaker and Lisellotte Rademaker; other competitors unable to be present included Tom Moulton, Joe Hedges and Daan Rademaker. This year the competition for the trophy was extremely close, with the outcome depending on the very last race of the series. In the end, the eventual winner was Fraser Martyn (pictured centre below) whose racing improved by leaps and bounds as the series progressed, with Emily Veal and Willemijn Rademaker second and third respectively. Sincere congratulations to all the competitors for managing to complete races in conditions that varied from too little breeze (as on the final round racing, shown in the pictures below) to rather too much wind for comfort. The trophy is awarded in memory of Peter Pocock, a much-liked and respected member and officer of the club in its formative years. As in previous years, this series has been used as a means of gradually introducing the concepts underpinning the various racing rules over the duration of the series, so that juniors new to racing are not overwhelmed by all the intricacies of the rules at one go. The series will be running again in the 2009 season; dates have yet to be decided, but are likely to in summer on either side of the school holidays. 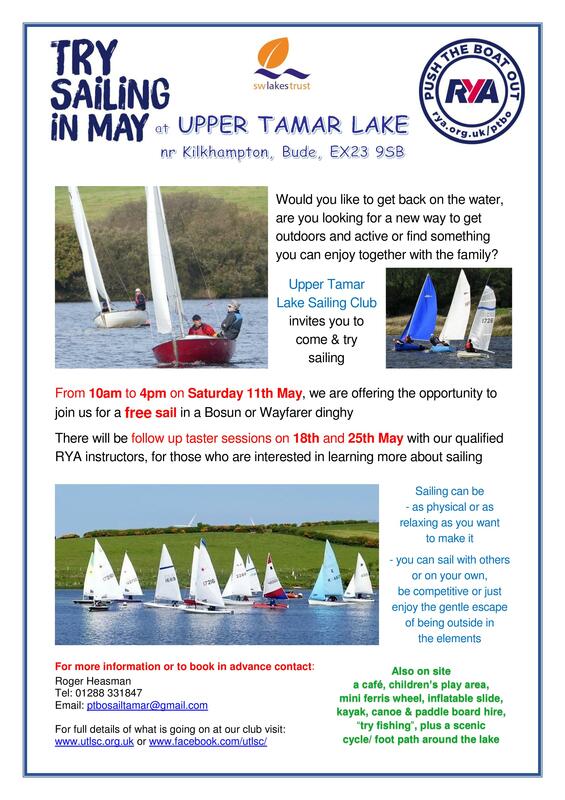 Any new junior sailors who might be interested in taking part in what has always been a gentle and non-threatening introduction to dinghy racing are very welcome; contact the Vice-Commodore Roger Heasman (tel 01409-241055 or e-mail rogerheasman@hotmail.com) for more information or with any queries – and we look forward to seeing everybody on the water in a few months time and the series continuing to grow from year to year. Although most of the club’s sailors sail primarily on the home waters of Upper Tamar, a number do sometimes venture further afield for some of their competitive sailing. The photos below provide a pictorial record of some of their ‘Away Days’…..
Club junior sailors Katherine and Stephen out there somewhere – the Topper fleet at Paignton: a total of 330 boats and a 4 mile course – and how do you find your trolley afterwards….? A tree planting ceremony was held at the lake on Wednesday August 13th August, attended by a very large group of family and friends, including a sizeable number from the sailing club. The Commodore, Nicky Buckett, gave a eulogy, remembering Rob’s contribution to sailing club, including his time as Commodore and the many happy times he had enjoyed there. The address was made more poignant for all those who had memories of afternoons spent over the years watching Rob helm his beloved red Wayfarer across the lake in the background. The pictures below show Rob’s wife Ragna and his sister Sue (with help from a number of club members) planting the tree (a native cherry) close to the water, overlooking the lake which he so loved. Many thanks to Bob Sampson for providing the pictures. Another excellent day out, this time at the Exeter Canal where members paddled their own canoes (actually Waveriders), except those that went out double-handed in Canadian canoes. After setting out from ‘Saddles and Paddles’ on the River Exe at Exeter Quay, the intrepid group soon got to grips with the craft of their choice and, avoiding the sudden drop over the weir, paddled onto the calmer waters of the Exeter Canal. The group set off down the canal – and soon found that head winds are a distinct disadvantage in boats without sails that have to be propelled by elbow power. Nicky and Emily ambushed Bob and made off with his baseball cap, before everybody had to go into limbo mode to shoot a very low footbridge, as demonstrated by Simon below. The whole flotilla arrived safely at the ‘Double Locks’ pub for a well-earned drink and a meal, before setting off back for a (wind-assisted this time) return to Exeter Basin for a quick look round the varied craft moored there (see picture 4) before heading back to the starting point on the Exe. An excellent day out and many thanks to Steve for organising it – and thanks to Bob for the photos. Despite leaden skies and heavy rain driven by gale-force winds, a hardy band of Tamar regulars nevertheless turned up at midday at Wadebridge on 29th March for the Padstow cycle ride, apparently game for anything. Nevertheless, a few moments standing on the bleak tarmac of Lidl’s car park soon tempered Tamar’s normal sunny optimism with a cold dose of reality and it was quickly agreed that battling the exposed and windswept reaches of the trail to Padstow was not an enticing prospect, especially given the likelihood of having to pedal into a fierce headwind on the way back. Instead, as a compromise, the group decided to do a gentle walk along the hopefully more sheltered inland section of the Camel trail, heading towards Bodmin. Heading off through the town, gender stereotyping soon set in, with most of the ladies disappearing into a discount shoe shop whilst the men succumbed to the blandishments of the open door of a tool shop. With all these competing attractions, Bob as walk leader had a hard time and getting all the individuals headed out in the right direction was somewhat akin to herding cats, but eventually the group made it out into the terra incognita of the trail towards Bodmin, where no-one in the party had previously ventured. In the steep-sided valley, once out of the wind and with the rain easing and stopping, spirits soon rose; like dismounted cavalrymen on the retreat from Moscow, murmurings were heard that actually we didn’t need to have come on foot – and actually could have cycled this way after all. Nevertheless, the group pressed forward on foot, with a tacit agreement that we’d turn round in good time so that we didn’t go too far. As usual on Tamar socials, though, everybody was soon so busy chatting as to not notice the passing of the miles and were brought up short when John Leveridge (who’d had the good sense to bring his OS map) announced that we’d passed the point of no return and that it was now shorter to walk on to Bodmin than to head back to Wadebridge. With rumours of a good pub on Bodmin outskirts to entice everyone on, the group continued forward, though looking along a long straight section of the former railtrack disappearing into the middle distance, some faint-hearted souls did wonder if the pub was something similar to the mirages of oases encountered by weary desert travellers. The Camel trail was considerably more gentle and welcoming than the average desert, though, with daffodils and early bluebells along the path and the swollen River Camel rushing noisily over the rocks. The next landmark was Boscarne Station at the end of the Bodmin and Wenford Steam Railway branch, but a quick examination of the timetable revealed that the last train of the day had already gone. However, an encouraging local said that the pub was just a few minutes further on and soon the by now slightly weary band straggled into ‘The Borough Arms’, which did indeed live up to its reputation as an oasis of good food and drink. By the time the group had got to the coffee stage, however, the rain had returned in earnest and no-one fancied retracing our steps. Fortuitously, what must be one of the few bus routes in Cornwall with a regular service stopped immediately outside the pub. After an uncomfortable few minutes huddled in the lee of the pub wall, the bus silenced any doubters by turning up absolutely on time and after a headlong dash through the winding Cornish roads deposited the Tamar sailors back in Wadebridge – in fact, so quickly that there was still time for several of the party to get back into the shoe shop just before closing time and purchase sufficient stock to probably regenerate the entire local retail economy in a single afternoon…. In all, there was general agreement that it had been a very enjoyable afternoon out, perhaps especially because the prospects had seemed so poor at the outset. Many thanks to Bob Sampson for organising the day and persevering with it – and to Nicky Buckett for the photos, taken to prove that despite the weather, we’d made it out and had a really good time. Many thanks to Stephanie Heasman for the photos. and it is believed to have been said by Sir Isaac Newton. Many thanks to Steve and Bob for setting the questions for the quiz – and also to Neil and Barbara for hosting it at their house; it was a very enjoyable evening, with lots of chat, talk about the forthcoming season – and of course, food and drink, to leaven any possible brain strain….